Occupational Medicine clinical experiences can be done at the University of Rochester Occupational Medicine outpatient clinic. Hypertension screening and treatment with national expert and JNC VII panelist, Dr. Bisognano. For each of the experiences (dyslipidemia and hypertension), residents are asked to commit to at least eight, ½ days and in the case of Dr. Bisognano’s clinic may be limited to that as well. Each provider sees patients once a week. 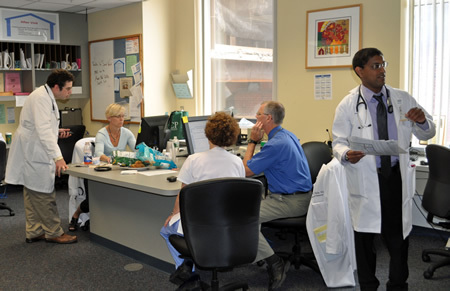 UHS is the student health service for all students at the University of Rochester and it also serves staff and faculty who use it for their primary care. Residents training will primarily focus on developing skills in reproductive health and mental health counseling, but will include a diverse set of health issues. Residents in the past have arranged their own clinical experiences in Pediatric Preventive Cardiology, which meets weekly and sees children with potential and existing lipid problems and hypertension problems (Dr. Marc Lande). Residents are encouraged to talk with the residency director if they wish to explore setting up a rotation in a particular subspecialty clinic in Rochester. The residency program has developed a clinical rotation at the Sodus Center, a Finger Lakes Community Health Site.